Just three years removed from a World Series championship, the 1985 St Louis Cardinals appeared to be a team in total disarray as the new season began. The front office failed to re-sign future Hall of Fame free agent relief ace Bruce Sutter (45 saves in ’84) to the kind of long-term deal he wanted; when Braves owner Ted Turner made Sutter an offer he couldn’t refuse – a whopping $10 million, six-year contract – Bruce bolted to Atlanta. Meanwhile, the Redbirds appeared to have no bona-fide closer waiting in the wings to fill the void, prompting Whitey Herzog to comment, “I just became 45 games dumber than I was last year.” Even with the greatest closer in the game on their side, the 1983 and 1984 Cardinals were mediocre, at best. They had no real power hitter, their starting pitching was marginal, and now with Sutter’s departure to much greener pastures, their bullpen looked even more suspect. About a month after the defection of the 32-year old Sutter to the Braves, the Cardinals unexpectedly fired general manager Joe McDonald, a close Herzog confidant from the Mets organization, who Whitey imported in ’81, shortly after accepting Gussie Busch’s deal to take over control of the team. Suddenly, the front office now also appeared to be a mess; to the casual observer, the Cardinals organization was a complete disaster, just two months before spring training was due to commence. I must admit, I was not at all optimistic about the team’s direction, as I glumly anticipated another season of futility. I think most of Cardinal Nation shared that pessimistic mind-set. Needless to say, the media had a field day with all the turmoil, and who could blame them for reporting the gory details of a crumbling, once-proud organization? Gradually, as the winter of ’85 progressed, good things started happening; on January 23, the team signed a relatively unknown free-agent, Mike LaValliere, to a contract. Nobody really seemed to notice or care; the big news would happen a little over a week later. If you’re a Cardinals fan, February 1, 1985 is a date that will be fondly recalled as the turning point in the team’s mid-1980s fortune. That date has always put a smile on my face as I sit back and reflect upon its wonderful significance over the years. February 1, 1985 was the date the Cards swung a deal with the unsuspecting San Francisco Giants, essentially trading a bunch of worthless players for the player who would be the offensive catalyst for a squad that would be attending two of the three next World Series engagements. The disposable players the Cards dispatched to San Fran: David Green, Dave LaPointe, Gary Rajsich, and Jose Uribe. Uribe turned out to be a pretty decent player for the Giants; the other guys didn’t pan out so well. As it would turn out, Clark would only spend three mostly glorious seasons in St Louis; but he is to this day, still a huge fan favorite, and rightfully so. I love him! To me, and most of the other Cards fans I knew, our team had become an automatic contender in the good old National League – East for the upcoming season; now, I could hardly wait for Opening Day. In the meantime, Dal Maxvill was hired as general manager on February 25, giving further stability to the organization. In early April, they swung a couple of additional deals that seemed rather inconsequential at the time, but would prove to be definite winners for the club, short-term and long-term. The first deal brought future “folk hero” Jose Oquendo over from the Mets, and he has been with the organization ever since, first as an amazingly versatile utility player, then later on as a coach and possible managerial candidate, if Tony La Russa ever decides to quit his day job. The second deal brought pitcher Bill Campbell and infielder Ivan DeJesus over from the Phillies, in a move that shored up the bullpen a bit and gave them another valuable utility player to lend further stability on the infield. DeJesus was rock solid for the Redbirds in ’85, doing stellar work whenever called upon to start a game or two, providing his share of clutch hits for the team, especially down the stretch. I’m not so sure the Cardinals would have survived the strong challenge from the New York Mets that year, without DeJesus’ solid play and timely hitting. As Opening Day approached, I felt good about the team’s chances for postseason play as I reviewed the new, improved roster. Not only did the offense look much better with Clark now batting cleanup, but the addition of lefty John Tudor (acquired from Pittsburgh for George Hendrick) gave the Cards another quality starter. What impressed me about Tudor was the fact that he spent a number of years pitching quite well for the Boston Red Sox, who play half their games in a right-handed hitter’s paradise – Fenway Park. I felt the change of venue would certainly work in his favor; that would turn out to be a huge understatement. The rest of the baseball establishment did not share my optimism about the Cardinals; in fact, most “experts” predicted a last place finish for St Louis, proving that most “experts” are “morons” (except me). After the Cardinals lost the first four games of the season, the experts appeared to be right; the team still looked shaky, and to add insult to injury, one of their best players – Willie McGee – got banged up running into a wall (trying to catch a ball that was well on its way to leaving the yard for a home run). Forced to tap into their farm system, Dal Maxvill called up rookie Vince Coleman to fill in for the injured McGee; this “temporary” reserve player, of course, never returned to the minors, and would go on to win the National League’s Rookie of the Year Award, highlighted by a NL rookie record 110 stolen bases for the Runnin’ Redbirds. Coleman was the final piece to the offensive puzzle, giving the team the ability to score by utilizing speed to scratch out runs, almost at will. After that dubious 0-4 start, the Cardinals gradually started their climb out of the division cellar, towards respectability. The much maligned bullpen was starting to pitch exceptionally well, as a unit. One night, Jeff Lahti might be called upon to get the save; the next night, it might be Ken Dayley; a third night, perhaps it would be Bill Campbell. “The Bullpen by Committee” was created, almost by accident, but they always seemed to get the job done, game in and game out. Meanwhile, the starting pitching – anchored by Joaquin Andujar, Danny Cox, and newcomer John Tudor – was emerging as one of the elite rotations in the league; Tudor, who began the season poorly, turned things around when a buddy of his tipped him off about a mechanical flaw in his delivery, after watching him pitch in mid-May against Bruce Sutter’s Atlanta Braves on WTBS. Tudor lost that game, but quickly got his act together for the remainder of the season, hardly ever losing again, with a slew of shutouts; as he and Andujar both eclipsed the 20 win plateau. May 17 – The Cards were trailing Houston 6-5 at the Astrodome in the top of the ninth inning; with two outs and nobody on base, consecutive singles by Willie McGee, Tom Herr, Jack Clark, Andy Van Slyke, and Terry Pendleton give the Redbirds an 8-6 win. May 31 – Danny Cox takes a perfect game into the eighth inning against the Reds at Busch Stadium, retiring the first 23 batters he faces; he yields two consecutive singles before settling back down again to complete the complete game shutout, 5-0. June 8 – Tom Herr’s ninth inning home run at Shea Stadium vs the Mets provides the lone run of the game; John Tudor pitches a brilliant complete game shutout, 1-0. June 14 – The Cards pull off a wild 11-10 win over the Cubs at Wrigley Field; the final out of the game is recorded when right fielder Andy Van Slyke makes a spectacular catch of a foul pop up near the line in right, avoiding a collision with both Tom Herr and Jack Clark, who were chasing after the ball, as well. The Cubs had two men on base when Van Slyke saves the day. The Redbirds would go on to sweep that three game series, setting the tone for the remainder of the season; the Cubs fell out of first place, then quickly faded into oblivion shortly thereafter. June 22 – Curt Ford delivers a 10th inning pinch single to drive in Ozzie Smith with the winning run at Busch Stadium, over the Cubs again; 2-1. This was Ford’s first major league at-bat. June 23 – John Tudor’s two-hit shut out stymies the Cubs once again; 7-0. July 25 – The Cardinals rallied from a 6-0 deficit against the Padres in San Diego, scoring five runs in the ninth innng, en route to a 9-6 win. August 8 – John Tudor’s one-hitter beats the Cubs at Busch Stadium; 8-0. Former Cardinal Leon Durham singles in the fifth inning for the Cubs’ lone hit. August 23 – Joaquin Andujar wins his 20th game of the season with a 6-2 decision over the Braves in Atlanta. Unfortunately, he only won one more game down the stretch, going 1-5 with a 6.35 ERA. August 29 – The Cardinals trade Mark Jackson to the Reds for 34 year-old veteran, Cesar Cedeno. All Cedeno did for the rest of the year was hit .434 in 76 at-bats, with six home runs. This would be his last hurrah as a major league player; he would play in only 37 more big-league games after this season. September 11 – John Tudor pitches a 10-inning complete game shut-out over the Mets at Shea Stadium; this was his third consecutive shut-out; Cesar Cedeno’s 10th inning home run provides the margin for victory; 1-0. September 21 – Trailing 5-0, the Cardinals rally to beat the Expos 7-6 at Busch Stadium; a two-run home run by Jack Clark in the seventh inning puts the Cards in the lead for good. 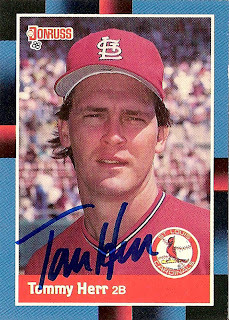 September 22 – Down 5-4 with two outs and nobody on base in the bottom of the ninth inning against the Expos at Busch Stadium, Willie McGee singles and Tom Herr homers for a 6-5 win. September 26 – John Tudor’s 10th consecutive win also happens to be his 10th shut-out and 20th win of the season; 5-0 over the Phillies at Busch Stadium. October 3 – The Cards salvage the third game of a three-game series against the Mets at Busch Stadium; 4-3. The win gives the Redbirds a two game advantage over the Mets with three games to play. October 5 – The Cards clinch the division title with a 7-1 win over the Cubs at Busch Stadium; John Tudor records his eleventh consecutive win, and 21st, overall. One thing that really stood out about the Cardinals’ regular season play that year – They never lost a single game whenever they had the lead after eight innings. The bullpen, which was considered to be the weak link for the team, heading into the season, emerges as one of the best in baseball; rookie reliever Todd Worrell is called up in August, and quickly asserts himself as the closer. Heading to Los Angeles to begin postseason play against the Dodgers, the Cardinals seemed invincible; it seemed playing the best of seven NLCS vs the Dodgers was a mere formality; and surely, whoever they faced in the World Series would stand no chance either. This was the perfect team; perfectly suited for their ballpark and ready to roll over any team standing in their way to the World Series championship. October 9 – The Cardinals open the NLCS with a 4-1 loss to the Dodgers in Los Angeles. John Tudor pitches poorly, allowing all four runs in less than six innings of work. The lowlight of the night occurs when Tudor intercepts a Terry Pendleton pass attempt to first base with his back. Terry had fielded a bunt attempt nicely, but John failed to get out of the way of the throw. Ouch. October 10 – The Cards lose again; 8-2. Joaquin Andujar, who pitched poorly over the last two months of the regular season, does it again; he gets racked for six hits in a little over four innings of work. October 12 – Vince Coleman’s baserunning prowess unnerves the Dodgers, as the Cardinals win; 4-2. It would be Coleman’s last postseason appearance in 1985. October 13 – While performing stretching exercises just prior to Game Four, Vince Coleman is run over by a one ton automatic tarpaulin, clocked at one mile per hour. Coleman is diagnosed with bone chip near his left knee, to go along with his “bonehead”. This is the first time in MLB history any player has been able to induce a tarp to roll over them; to this day, one of the fastest players the game has ever seen, has no idea how he was able to accomplish this feat. Later that night, Coleman’s replacement, Tito Landrum, collects four hits in five at-bats, as the Cards rout the Dodgers; 12-2. John Tudor pitches well and picks up the easy win. October 14 – Ozzie Smith’s walk-off home run in the bottom of the ninth inning gives the Cardinals a 3-2 win. This was Ozzie’s first career home run as a left-handed batter in over 3000 plate appearances; announcer Jack Buck’s “Go crazy, folks” call after the home run is now the ring-tone for the I-70 Baseball radio program. I love it. October 16 – Jack Clark’s three-run ninth inning home run gives the Cards a 7-5 win, and another trip to the World Series. I sent Tommy Lasorda a “thank you” card for pitching to Clark with first base open and Andy Van Slyke on deck. I wonder if he got it? October 19 – The I-70 World Series begins with St Louis winning Game One, in Kansas City; 3-1. John Tudor is the winning pitcher, again; I was already envisioning Tudor winning Game 7, for his third World Series victory, claiming the MVP honors, and wondering if he’d really want that Corvette he’d just won. Looking back on it, I think I may have been just a bit overconfident at this point. October 20 – Entering the ninth inning, the Cards trailed the Royals, 2-0. By the time they were done, the Redbirds walked away with a thrilling 4-2 win, highlighted by Terry Pendleton’s three-run double. I almost felt sorry for the hapless Royals, who had never won a World Series championship, and certainly had absolutely no chance of winning one this year; not against the best team in baseball, who just won the first two games of the World Series on the road, and were now coming home to finish off the four game sweep; or so I thought. Fun fact: Prior to 1985, no team in World Series history had ever lost the first two games at home and then gone on to win the Series. Reality: There is a first time for everything. October 22 – The Royals turn the tables and beat the Cardinals at Busch Stadium, with an easy 6-1 win. Royals pitcher Bret Saberhagen appears to be having way too much fun; suddenly, the script for the World Series has been changed, and I am getting mildly irritated. Who is Bret Saberhagen, anyway? Punk. October 23 – Order is seemingly restored in Cardinal Nation, as the invincible John Tudor’s five-hit shutout gives the Cardinals a seemingly insurmountable 3 games to 1 lead in the World Series. The fact that the St Louis Cardinals had a 3 games to 1 lead over the Detroit Tigers in the 1968 World Series, and ended up blowing that Series; did not even cross my mind at all. October 24 – The Royals win again; 6-1. The champagne, which was on ice, must now be shipped to Kansas City, where the Cardinals will surely win one game out of the two chances they are afforded. Fat chance. October 26 – With the Cardinals leading 1-0 entering the bottom of the ninth, Todd Worrell comes in to finish off the Royals. Two nights earlier, he pitched two perfect innings – the sixth and seventh – striking out the side in both innings. The first batter he faces, Jorge Orta, taps a slow roller towards first base; Jack Clark fields the ball and tosses the ball to Todd Worrell, covering the bag at first base. The play is a bit awkward looking, with Worrell reaching high for the toss and doing a “tap dance” on the bag to record the out. First base umpire Don Denkinger blows the call; Orta is ruled safe; the Royals rally for two runs to win the game and put the Cardinals in a state of catatonic shock. Fun fact: Prior to this game, the Cardinals were 91-0 when leading after eight innings; they never lose games in the ninth inning; this is the best team in baseball. Reality: There is a first time for everything. 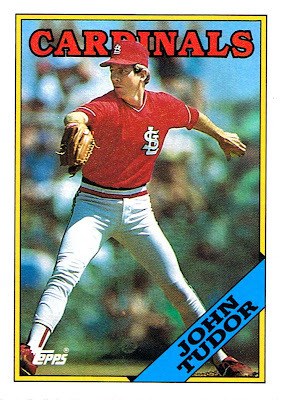 October 27 – The Cardinals send John Tudor to the mound in Game 7; the same John Tudor who won 21 games during the regular season, with ten shutouts; the same John Tudor who had already beaten the Royals in Games One and Four of the 1985 World Series. The stage is set. The ace of the staff is on the mound to start Game 7 of the World Series. Surely, the blown call the night before was a tough break; but that’s baseball. The measure of a championship team is the ability to bounce back from adversity; to overcome any obstacle standing in the way of victory. Unfortunately, the Cardinals had already given up after Game 6; they never really showed up for Game 7; even with their ace on the mound. Final score: Royals 11 – Cardinals 0. That was a sad way to end what was otherwise a glorious season for the Cardinals. For a quarter of a century, Cardinals fans have lamented the bad call Denkinger made in Game 6, as if that was the deciding game of the Series. They still had a chance to win the very next night; people seem to forget that; maybe because the game itself was forgettable. Still, 1985 was one of the most memorable seasons in franchise history; and certainly one of the craziest. I enjoyed every minute of it; until, of course, Game Seven. I prefer to dial that one out of my memory bank. Retired executive (26 years with Enterprise Rent-a-Car), author (Life Under the Corporate Microscope & St Louis Cardinals IQ - The Ultimate Test of True Fandom), baseball historian & diehard Cards fan (for over 50 years now). Planning to write another "Cards IQ" book over the winter, which should be in print by Opening Day, 2011.